Sardines are a small, oily fish known to provide a plethora of health benefits. These fish are commonly sold in canned form, and while they are a single species of fish, there are actually 21 types that are categorized under the name "sardines." Sardines first gained popularity in 18th century Europe, when the canned version was introduced, and they then grew in popularity in the United States in the late 19th and early 20th centuries. To this day, Americans still regard canning as one of the best ways to store food for long periods of time. Like many other types of fish and shellfish, sardines are low in calories and saturated fat and high in protein and minerals. Sardines do not contain any carbohydrates. They are mainly sought out for other nutrients, such as omega-3 fatty acids and protein. The oils in sardines are high in omega-3 fatty acids, which are commonly referred to as “healthy fats,” as they help to prevent heart disease and maintain controlled blood pressure. The fat found in these fish is also said to aid in skin health, preventing wrinkles and promoting radiance. One serving of sardines has almost 25 grams of protein, which is a substantial portion of the average daily protein needs for men and women. The fact that sardines are full of healthy fats and protein make them a winner when paired with healthy carbohydrates like whole grains or vegetables. In addition to the previously mentioned nutrients, sardines are high in niacin, which helps to keep the digestive system and brain functioning optimally, and selenium, which assists in proper thyroid function and protects the body from infection. 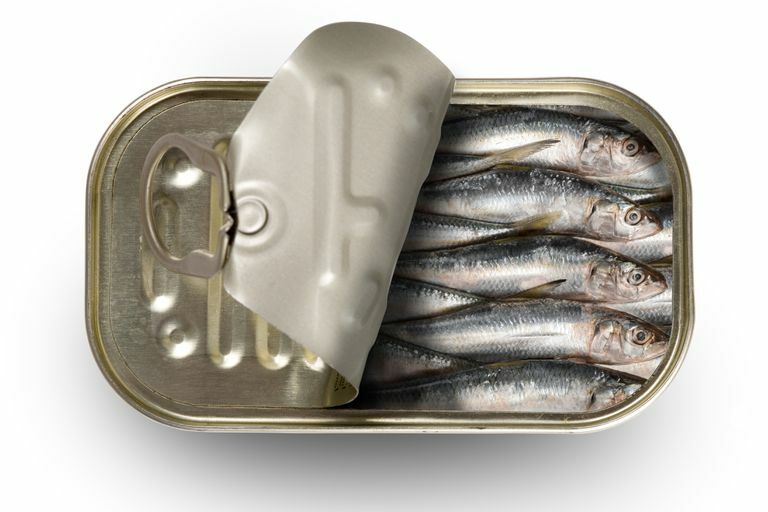 Because they tend to be preserved in salt, canned sardines also provide a decent amount of sodium, with 505 milligrams or 21 percent of your daily needs in one serving. However, keep in mind that sodium is a mineral most of us need to monitor to decrease our intake, rather than upping it. Sardines are also high in vitamin B12, vitamin D, and calcium. Vitamins B12 and D are essential for good bone health, energy, and to stave off cardiovascular disease. Sardines, particularly their bones, are also known to be high in calcium, which is key to building strong bones and teeth. Fish such as sardines have also been shown to be beneficial for brain health. In fact, a study from the Journal of the American Medical Association showed that people who consume fish regularly have a lowered risk of getting Alzheimer's disease. The subjects studied all had a genetic marker known as APOE ε4, which itself carries an increased risk of Alzheimer's, and the study results showed that eating fish appears to counteract the gene mutation's harmful effects. Lastly, oily fish such as sardines have been shown to support eye health. A study in the European Journal of Clinical Nutrition showed that consuming fish such as sardines can lower the risk of age-related macular degeneration (AMD), a condition that commonly occurs in adults over 50. Are sardines high in mercury? Many fish and shellfish have the potential for mercury toxicity. However, there’s good news: Sardines are one of many fish and shellfish that have some of the lowest levels of mercury and can be consumed without worry. Can I eat the bones? Many people prefer not to eat the bones in fish like sardines, but they are actually harmless and perfectly edible. The bones contain a good portion of the sardines' calcium, but if you still prefer not to eat them, you can easily find canned sardines that are both skinless and boneless. The fact that sardines are most often purchased canned means that you don't have to do much in the way of cooking or preparation. Canned sardines are usually pretty flavorful on their own, as they are usually preserved in salt. They can be eaten cold in salads, on top of crackers, warmed in pasta dishes, or even grilled as a main course. Fish allergies are fairly common, and unlike most food allergies that tend to present themselves in childhood, these might not show up until your adult years. While allergies to sardines specifically don’t appear to be as prevalent as others such as shellfish, many allergists recommend that those with an allergy to any type of fish avoid all other types as well. American College of Allergy, Asthma and Immunology. Fish Allergy. USDA National Nutrient Database. Sardines.